Microsoft recently announced at the 2017 SQL PASS event that they would be previewing a new tool for sql server that works across multiple operating systems. It’s now available for preview. This code will drop the login and users for all databases for a provided user name. and reports on its progress. This only works where the user and login match. This script does not check if users own any objects. Possible errors could be if a user is the owner of a database object. Checks all databases on a server for any users who do not have a correlated login, based on SID. Uses the undocumented command of sp_msforeachdb. You could put in a loop if you want to avoid this command. Returns the database name, owner, and size on a given server. Tested in PostgrSQL 9.2 and 9.3. We needed to capture physical reads over time from our SQL server. One method we decided to deploy was to check sys.dm_exec_query_stats periodically and capture the differences between each check. The way I am doing it below is not 100% accurate because sys.dm_exec_query_stats is based on cached plans and the server will let clear the plan data over time. This means that when the differences are calculated any plan that was cleared from cache would not be included in the current check, but would still be in the comparison record. This could be solved by storing and comparing at the plan level but for my purposes I prefer to store summary information and do not mind this issue because I am running my comparison every hour and then will be averaging the results over time, and the result does not need to be exactly precise, just close enough to give us a general understanding. This is what the table looks like with a few records. Note that this is a result of running the job multiple times with a few seconds between each interval. I have have heard and read many times over the years that Left or Right should always be used, where possible, instead of Like. On the surface, this does sound logical since the Like command is often used for pattern searching and one could assume that the Like command is causing some extra work to be performed by the SQL server engine even though the predicate expressions are essentially equivalent. I personally have always assumed that they operated equivalently, however, I had never performed a performance analysis to infer the true answer. Also, was curious to find if there was a difference in performance when applied specifically to an indexed column vs non-indexed column. The names and data structures in this example have been changed to protect the innocent. For this test, assume [SOME_TABLE] has 530 million records and contains two columns: [INDEXED_COLUMN], and [NONINDEXED_COLUMN]. Indexed_Column has a clustered index and Nonindexed_Column does not have an index. We will run a test using like and left against each column using a basic count(*) command. Output for queries 1 and 2 = 63 million. Query 1 used like and averaged 102 seconds over 5 measurements. Query 2 used left and averaged 103 seconds over 5 measurements. Output for queries 1 and 2 = 87 million. Query 1 used like and averaged 3 seconds over 5 measurements. Query 2 used left and averaged 14 seconds over 5 measurements. You can see from the results that Like is actually considerably faster than Left when applied to an indexed column. This is because Like is treated as a computed column, which can utilize indexes, while Left is a function which can not utilize indexes. If an index is not involved then Like and Left perform the same. There might be additional factors that impact performance differences which I am not considering such as other index types, and other data types. 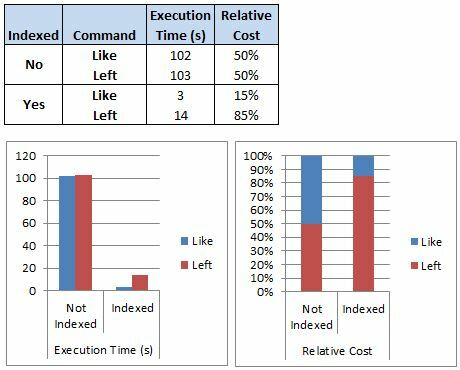 I came across another blog (http://cc.davelozinski.com/sql/like-vs-substring-vs-leftright-vs-charindex) where a similar test was done. Surprisingly, their results showed that Chardindex is the most efficient out of Like, Substring, Left/Right, and Charindex, and their results between Like and Left/Right are quite different than mine. At some point I’d like to go through their code and identify exactly what is different. Edit: The author reached out to me and mentioned that the main difference between our results is likely due to my analysis being ran on SQL Server 2008 R2 vs theirs being done on SQL Server 2014 and there have been changes to the query engine between versions. I encourage anyone seeing this to check out Dave’s blog.